Books and movies can give you a general idea of what a place and time period are like. 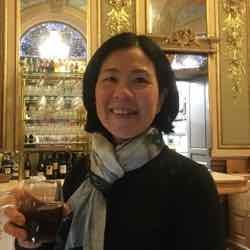 I had visited the D-Day beaches in Normandy, seen movies like “Saving Private Ryan”, “Schindler’s List”, and “The Longest Day” and read books such as “Suite Francaise” and “All The Light We Cannot See”. But being on a historical tour where you hear stories about life in Paris during WWII really brings it to life. 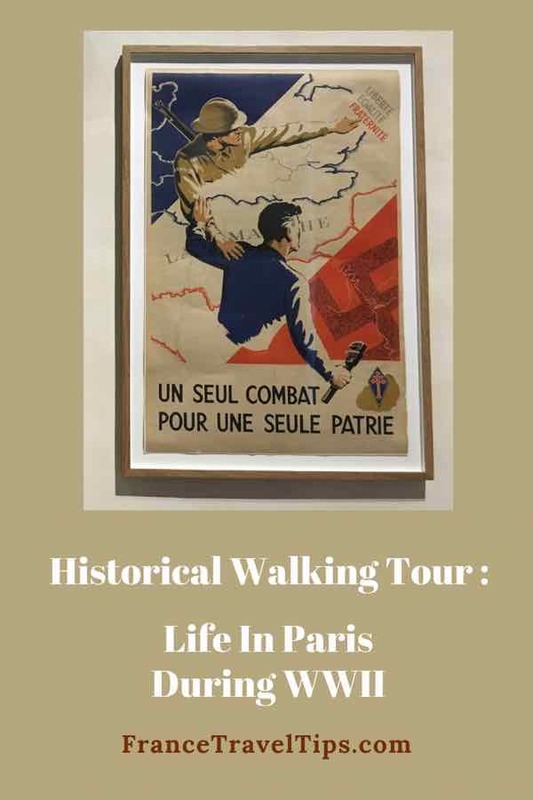 I was transported back to the 1940s when Paris was occupied by the Germans when I recently took a walking tour highlighting this time period in Paris and I discovered much more about the city that I have come to love. I joined a Localers tour which began in the Marais (3rd and 4th arrondissement). Our Localers tour guide Heidi did a great job sharing information about what life was like in the days before the Revolution leading up to WWII. 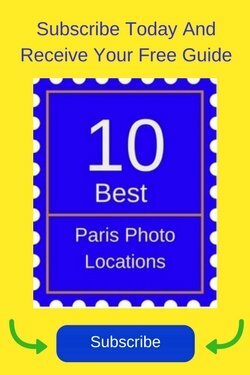 I’ve been to Paris numerous times but this tour exposed me to many new places and important historical sites. In the years leading up to the occupation of Paris, Parisians initially weren’t concerned that they would be affected. But there were others who felt precautions should be made. Actions were taken to protect famous works of art so that the Germans would not steal them. A movie that focused on this true event was “The Monuments Men” (with George Clooney). Some of the precious works of art such as Winged Victory and the Mona Lisa from the Musée du Louvre and some of the stained glass from Notre Dame Cathedral were removed in advance. The stained glass was sent to the Loire Valley for safe keeping. When the Germans overtook Paris in 1940, it was amazing but no shots were fired. Paris was like a ghost town because 60% of the population had already abandoned the city. They had fled to the countryside, the free zone, or other countries. 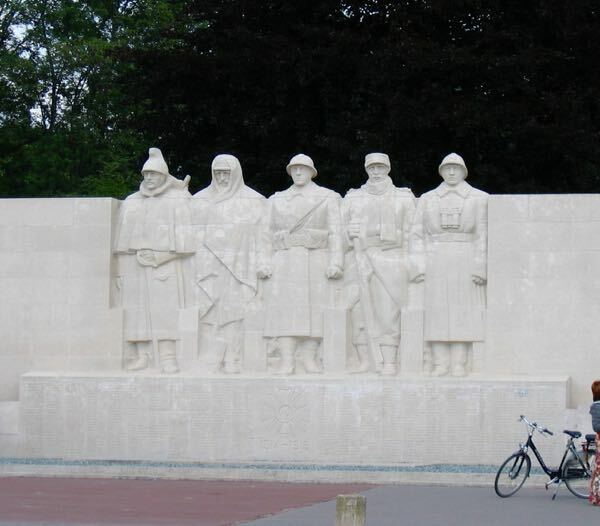 They knew the Germans were on their way. 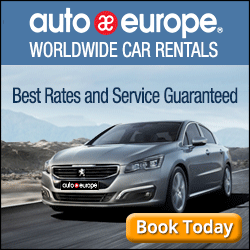 When they realized things were not as bad as they thought, many Parisians returned to the city. No buses ran and the Metro only ran in the morning and evenings to get people to/from work. There was a curfew from 9 pm to 5 am. 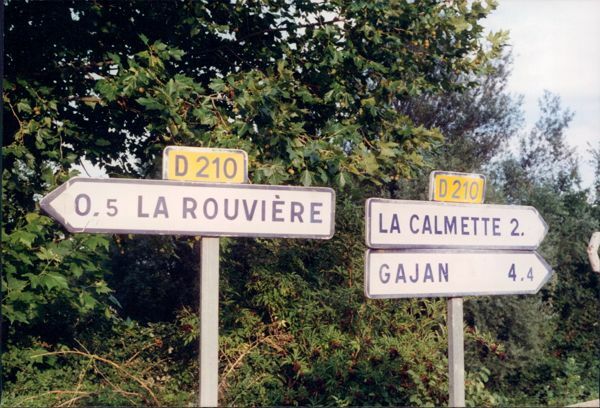 The Germans seized buildings and besides flying the Nazi flag, they also altered street signs so that the German font and name overshadowed the French name. Nazis and collaborating French took advantage of the black market, which sold goods at terribly inflated prices. Heidi gave the example of the cost to feed a family of four for dinner. It could cost a person 2 1/2 month’s salary..
Our tour began in the Marais (“the marsh”) and covers the 3rd and 4th arrondissements. It also has one of the main Jewish communities. Jewish citizens had to give all their personal information and as a result, the Nazis used this against them by restricting them from jobs and by taking things away from them. The Nazis targeted the Jews, particularly children. 11,000 children were deported and assassinated in Auschwitz because they were Jewish. 500 of them lived in the 4th arrondissement. 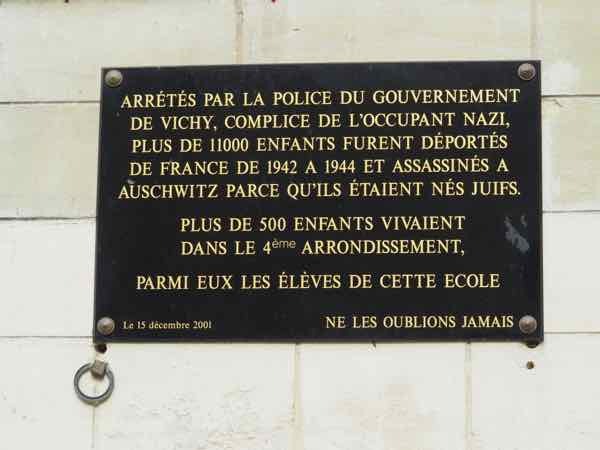 The sad fact was that it was not the Germans but rather the French police who decided to round up the children. Had I not read the book, “Sarah’s Key”, I would not have been familiar with the roundup and arrest of Jews by French police in July 1942. Over 13,000 Jews were sent to the Vélodrome d’Hiver, an indoor cycling stadium in the 15th arrondissement and were held there for days without food, water, or sanitation facilities. They were then sent to concentration camps in Drancy, France and then in Auschwitz, Poland. Joseph Migneret helped dozens of students by hiding them in his home and getting them passports. 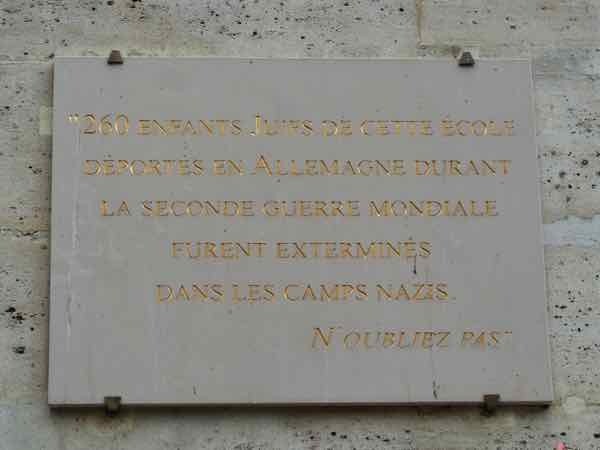 The school was open from1920-1944 and during the occupation, 260 students were deported and assassinated in the camps. Migneret was eventually arrested and killed. 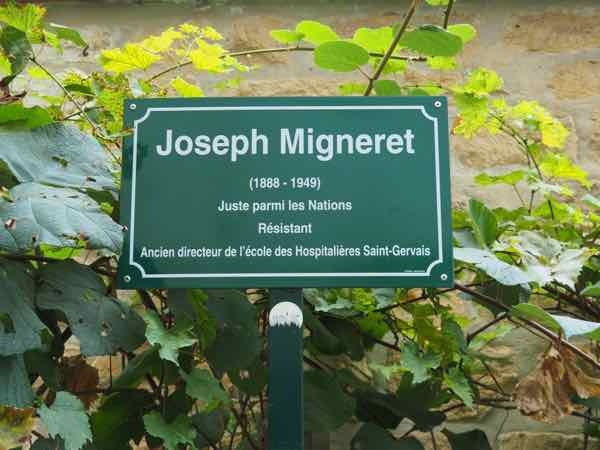 Jardin des Rosiers-Joseph Migneret Garden was created to honor him. Joseph Migneret is one of the over 3900 French citizens who risked their lives to save Jews in France during the War. 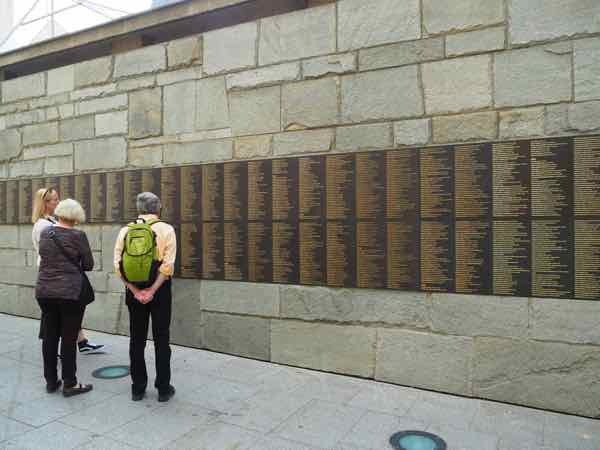 Each year additional people are recognized and their names are added to the wall. It wasn’t until 1995 that President Jacques Chirac became the first President of France to finally acknowledge the French complicity with the Nazis. apologized for France’s complicity with the Nazis during the war. The Wall of the Righteous is on the outside of this museum on Allée des Justes. 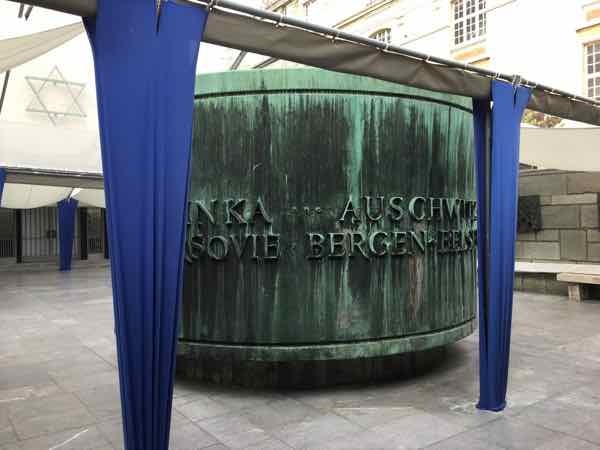 Inside is a memorial to the 76,000 victims of the Holocaust who were from France. Only 2500 survived. 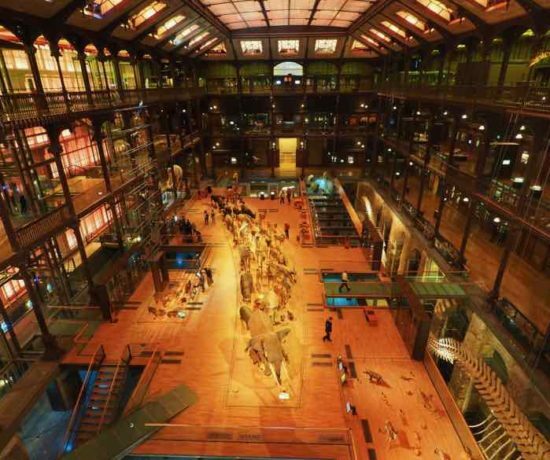 It is an incredibly interesting and moving museum that is free to visit. 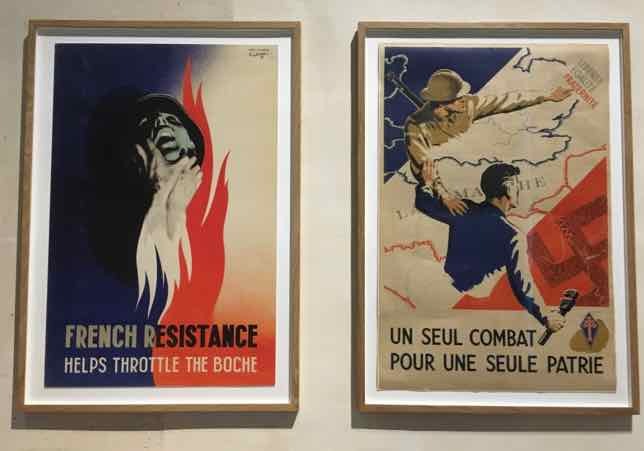 The French resistance was a grassroots movement and in the final 6 days of the occupation of Paris in August 1944, there were major strikes, street fighting, and the storming of the prefecture (police headquarters). By this time, there were approximately 25,000 Nazis in Paris with more firearms and tanks than the resistance who only had handguns. On August 19, 1944, the Nazis came down rue de la Cité near Notre Dame in tanks and fired 2 shots from cannons. The building, which is a Prefecture de Police (Police station) was hit and the scars still remain. Hitler had instructed the last Nazi commander in Paris, General Dietrich von Choltitz to destroy Paris by planning mines throughout the city. The General knew they were losing the war and he had no intention of destroying all of it. He disobeyed Hitler’s orders and saved Paris. On August 25, 1944, the Allies arrived in Paris and liberated it from the Nazis, marching down the Champs Elysee. 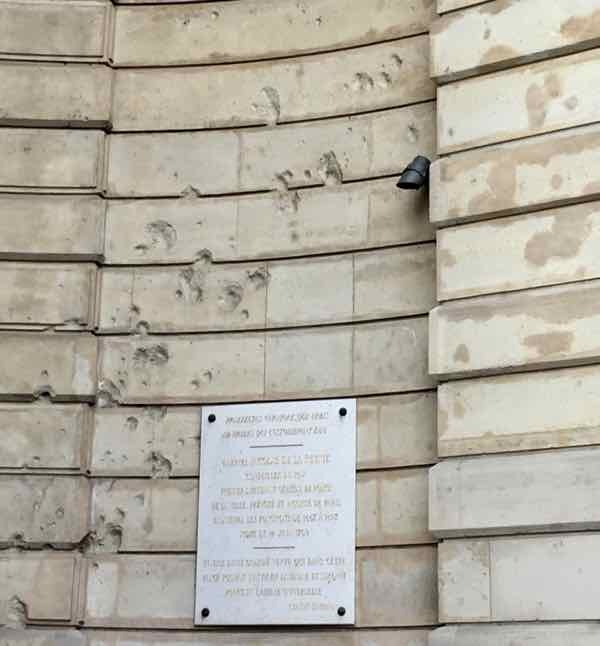 Throughout Paris, you will see plaques on walls honoring those who were part of the resistance as well as those who died at the hands of the Nazis. 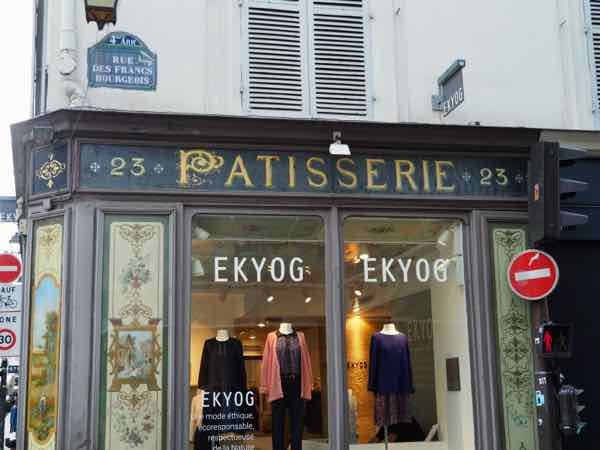 There is so much history particularly in the Marais with reminders of what life was like in Paris during WWII. Thank you to Localers Paris for providing this unique experience. As always, all opinions are my own and reflect my experience on the tour. After the war, France was badly divided over questions like “who collaborated with the Nazis?” There was a real risk of civil war so Charles de Gaulle came up with what became the national myth: Yes, there were a few bad pommes but the rest of us were in the Resistance and nobly protected our country. This wasn’t true, of course, because the Vichy government and many French collaborated. When the truth finally came out about 25 years after the war, the French were shocked and had a hard time dealing with it. The excellent book The Vichy Syndrome by Henry Rousso does a wonderful job of explaining this. Thanks for the insight and recommendation! Thank you, Jan, such a lovely detailed post! We are happy to learn you had a lovely time on our tours, and we hope to see you again soon! Sometimes our better angels are in short supply. Sounds like this was an interesting and important tour that more people should take lest we forget. Yes, they are. It’s so moving to hear what people did to save their Jewish students, friends, and family members…and strangers.